22nd December 2018, 7 a.m., Indian Academy playground, five acres of land, surrounded sparsely by eucalyptus trees, was completely draped with fog. Cold breeze rushed past my ears as I looked at the students walking on the ground in the morning waiting for the day ahead of them. For some it was a day to cheer up their friends and for some it was a day to just go and give their best shot on the field. They would know later that it would be a long day. They would know later how it feels to win. They would know later how it feels to lose; there was a lot in store for them during the day. 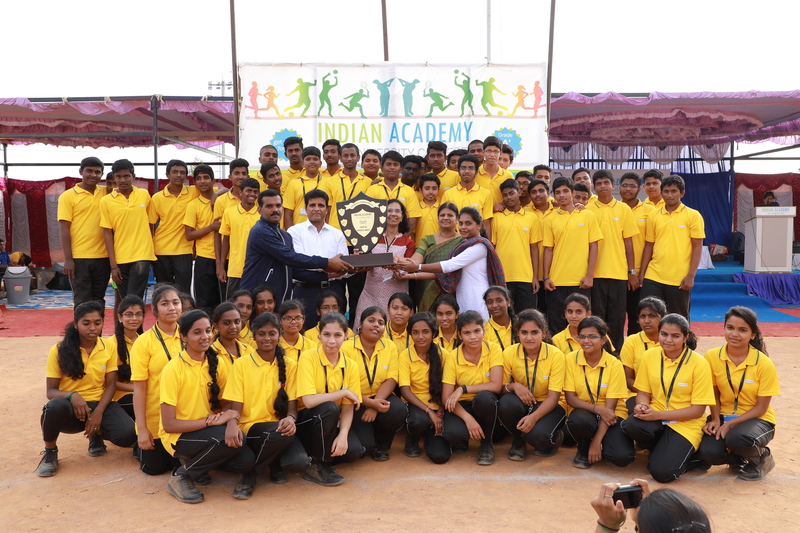 When all the students were in the playground, Dr. Raghupati and Mr. Prasanna Gowda from the Department of Physical Education, convened them to participate in the first event of the day – 1500 m race. Later, around 9 a.m., when the Chief Guest of the day Mr. N. Lohith, the International Fencing Player, joined us, all the students assembled class-wise for the march past to honor him and our Chief Patron Dr. T Somasekhar. Immediately after the inauguration programme, all the students lined up to participate in the track and field events which lasted till 2 p.m. Let’s-give-it-a-try thought brought a huge participation from students, girls and boys alike. It was not yet over after lunch. It was now time for teachers to embroil themselves in a war like situation—Tug of War, a ridiculously one sided affair since my opponents won it in seconds after it started. The day ended on a cheerful note as the winners and runners were given away prizes by Dr. T Somasekhar, Chairman, IAGI and by Prof. J Rajeswari, Principal, IAPUC. I convey my heartfelt congratulations to the athletes of the day Miss Keerthana and Mr. Punith G who bagged the most number of trophies on that day. The morning fog was replaced by the evening dust wafting over the ground as the busses carrying the students back home drove past me.